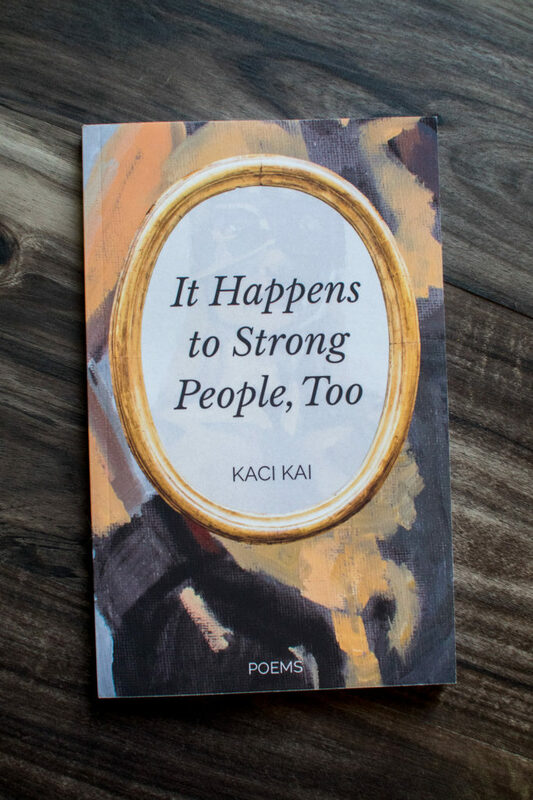 In her poetry collection “It Happens To Strong People, Too”, Kaci Kai explores moments of self-discovery, love, and the internal struggle we all have to feel worthy of belonging. Kai displays a splendid talent for mixing her experiences with a touch of relatability and nostalgia, which gives her readers a beautiful collection of poetry to immerse themselves in. I think this piece speaks to the depths of the human experience. We all have the cliff notes version of our lives that we share with others. This version can paint us in so many different lights, and the perception can be different to everyone. But, there is so much more to each of us, and the foot note won’t even scratch the surface of our beautiful complexity. Bones and Mistakes is my favorite poem in the collection; it’s a beautiful tribute to the healing process that honors what we all go through as we evolve over time. The author starts this piece in reflection about how we hold onto the people we used to be as we change and grow. I loved her description of how everything we’ve ever been creates the map of who we will become. Instead of being ashamed of our past, the author paints a picture of how our bones and mistakes set the foundation for our lives and who we are. Kai also writes so openly about her struggle with depression and the physical manifestations it often has. You can read in “Disordered” and “I Lost Weight” how her relationship with food changed when she was going through awful heartbreak. Food used to be a symbol of love and unity in her relationship and now, it represents hardship for her. It became a burden, a necessity for survival, instead of a celebration of love. I really appreciated these poems because I think that when we experience loss or heartbreak, some things can become tainted. Whether it’s a favorite song or a restaurant or certain activities, it can change the way you feel about them when you experience them again without the other person. I love how each section of this collection pulls you in with its relatability. The emotions of the writer are so eloquently described in a way that makes you feel understood in your experiences. In her transparency, you can feel the author’s pain when she battles depression, heartbreak, and loss. I think this poem serves as an important reflection of life as a whole: very seldom do we have control over our circumstances. In the beginning of the poem, the author describes the feelings of exhaustion she eventually feels from pushing against the current for so long, and I think that’s an important message for all of us. We all are in a constant battle for control over our circumstances, raging against change or heartbreak with all of our might. I love the underlying message of quiet bravery: keeping your head above water and surrendering to change, even when it’s the last thing we want to do, even when it goes against our every instinct. Kai has such a relatable poetic voice that will pull you in from the very first page. She has created a lovely collection that is sure to become a favorite in the hearts of her readers.